Ginger Jentzen, an anti-establishment candidate for City Council, makes a critique of local media part of her campaign. Candidates who seek to change the broken politics of our times cannot ignore the role that media play in local, state, and national elections. They have to address it. 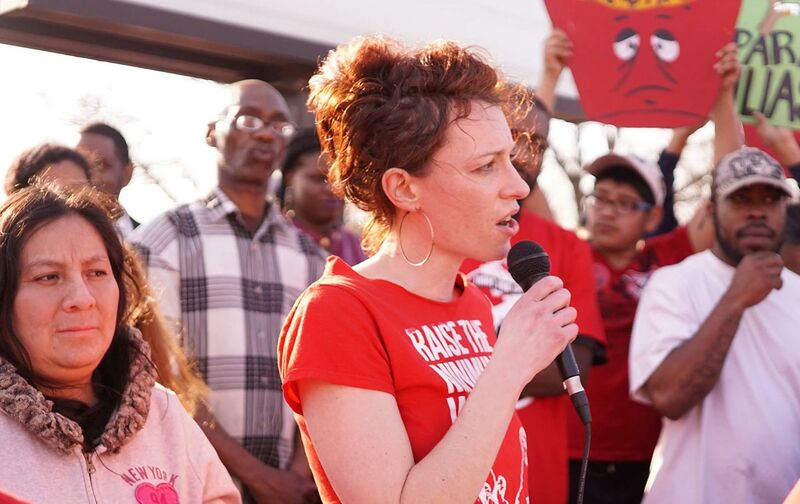 So Ginger Jentzen, a living-wage activist who is running a serious campaign for an open seat on the Minneapolis City Council, greeted her rejection by the major paper in town by celebrating the fact that she was not endorsed. The influential Minneapolis Star Tribune went out of its way to make clear that it did not favor Jentzen—explaining that, in a four-candidate field, she was not the paper’s first, second, or third choice. Each ballot will have three repeating columns. In each office, voters will complete the ballot from left to right, indicating their first choice for each race in the first column by filling in the oval next to the selected candidate’s name. If voters wish to rank different second and third choices, they will select them in the second and third columns on the ballot. [o]n Election Night, ballot counting machines will be used to provide first-round results, counting every first-choice selection. Candidates who have enough first-choice votes to win their particular races will be declared winners. Races in which it is not possible to determine winners solely on the first-choice rankings will proceed to round-by-round RCV tabulation beginning the day following the election.… Candidates with no mathematical possibility of winning (including the candidate with the lowest number of first-choice votes) are defeated, and votes for those candidates are transferred to the next ranked candidate on those ballots. Votes are re-tallied. If no candidate reaches the threshold to be elected, this process is repeated until either a candidate reaches the required threshold and is declared the winner, or only two candidates remain and the candidate with the most votes is elected. The Star Tribune is one of the dwindling number of metropolitan daily newspapers nationwide that still make an effort to cover, analyze, and express preferences in the myriad urban and suburban contests for mayor, city-council and school-board seats, and other posts on off-year election ballots. That’s an admirable commitment. But it can also be controversial, especially in a new-media moment when there are so many avenues for responding to traditional media. The paper, which has endorsed plenty of Democrats and Republicans in recent years, still takes some hits from hard-line conservatives. But this year the paper is also taking flak from a serious contender who has pushed beyond narrow partisan and ideological boundaries and seeks a deeper debate about fundamental economic and social issues. The Jentzen campaign is highlighting all those endorsements. The campaign is also highlighting its biggest non-endorsement. “We’re proud to be the only campaign not endorsed by the billionaire-owned Star Tribune,” announced the Socialist Alternative candidate’s website after the Star Tribune ran what the campaign terms an “Anybody But Ginger” editorial. It’s no surprise that in Ward 3, the Star Tribune endorsed anybody but Ginger. The Star Tribune’s owner, billionaire businessman and Timberwolves [NBA basketball team] owner Glen Taylor, is a major Republican donor who has given hundreds of thousands of dollars to the [Republican National Committee] and to conservative politicians like Michele Bachmann and George Bush. Time and time again, the Star Tribune has vehemently opposed pro-worker policies and been a mouthpiece of big business. While Ginger led the grassroots movement to win a $15 minimum wage, the Star Tribune called on City Council to reject $15 and advocated that the Working Families Agenda be “scrapped.” While Ginger calls for taxing the rich, the Star Tribune supported corporate welfare to fund the [Minnesota Vikings football] stadium. Jentzen’s camp has noted that several Star Tribune endorsements paralleled those of the developer-funded “Minneapolis Works!” political action committee, which has flooded the 3rd district with mailings that attack her as “a self-proclaimed socialist” who is “nuts (and dangerous)” for promoting rent control and progressive taxation. We’re proud to be the only campaign in Ward 3 not endorsed by the billionaire-owned Star Tribune. We’re proud that, instead, we’re endorsed by union nurses, communication workers, the Sierra Club, and other Bernie [Sanders] supporters like Our Revolution Twin Cities and Dr. Cornel West…. We can’t let big developer money and the corporate media sway this election. Together, let’s make history and win a voice in Minneapolis City Hall that’s fully accountable to working people. This Minneapolis City Council election is one of thousands of local contests in cities, villages, and towns across the country this fall. But, as with the 2013 Seattle City Council race that saw the election of Socialist Alternative candidate Kshama Sawant, this one could send a powerful signal regarding the ability of anti-establishment candidates who embrace “the S word” to upset the traditional political calculus—and the traditional media calculus.